Help with this Smuggler Blaster? I don't doubt it's an original, would love to hear your opinions thought folks. I can't say anything for sure, but his sister's blaster I have (here) shares some similarities. The Leia blaster is nearly clear at the end of the handle on mine and there is a bit excess flashing on the magazine. Aside from that, it looks like my other blasters and I don't doubt it's authenticity. Ozio posted about some Ledy figures, weapons and accessories here, but even though he shows and explains about Ledy, I see no reason why the same couldn't happen at any manufacturer. I will say this, I like mine! haha.. especially how you can see little color flecks as it goes from blue to clear. I just wish it was on the barrel, not in the hand so it can be seen easily. So, back on point, I am no expert but I would say it is legit. 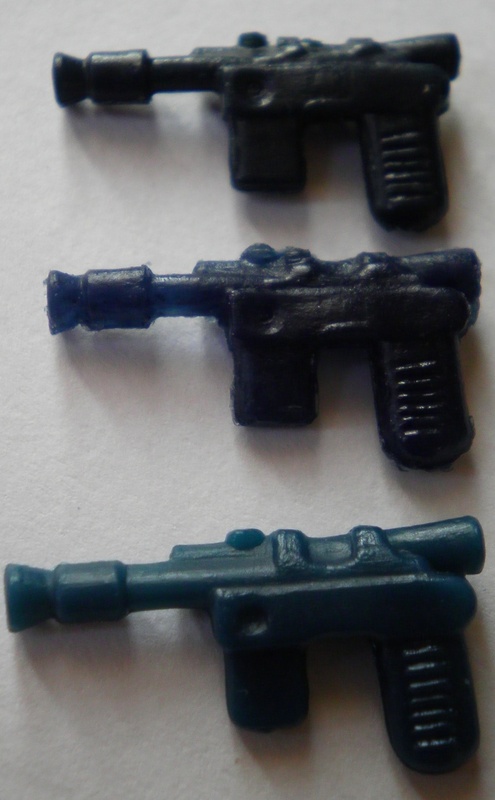 I haven't seen any really good repros of the smuggler blaster so if it is fake, it is a good one, it is odd, but good. 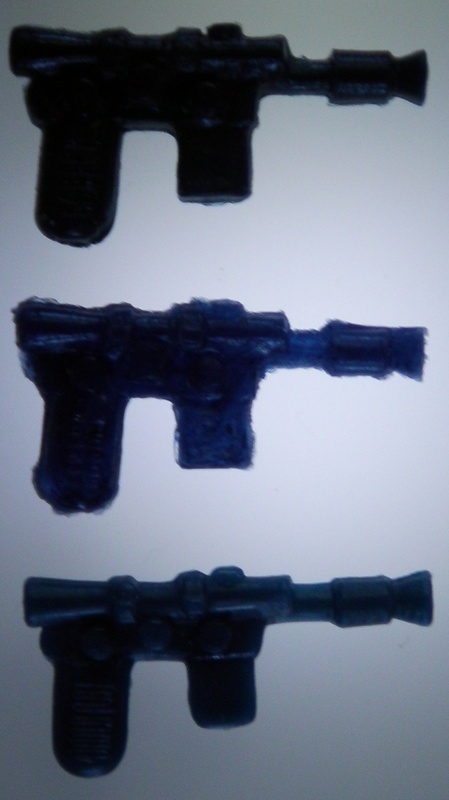 Cheers man, like you said, I don't doubt it either, if anything it's the odd colour (which doesn't really show in the pics) that is the most bizarre, it's unlike any of the other plastic colours I have for any weapon and also unlike the other translucent weapons I have (mainly stormie blasters). Your right though, don't see why this process wouldn't happen in any plastic related factory. It looks okay Alex, judging by the dot on the magazine and large circle on the upper part of handle I agree it's likely a V3 example that has suffered during the moulding process. Cheers dude, just edited the bottom of my first post where I put 'I don't doubt it's fake', just read all wrong I meant I don't doubt that it's original. I agree it's likely a V3 example that has suffered during the moulding process. Such an odd colour as well. Sorry for late reply. 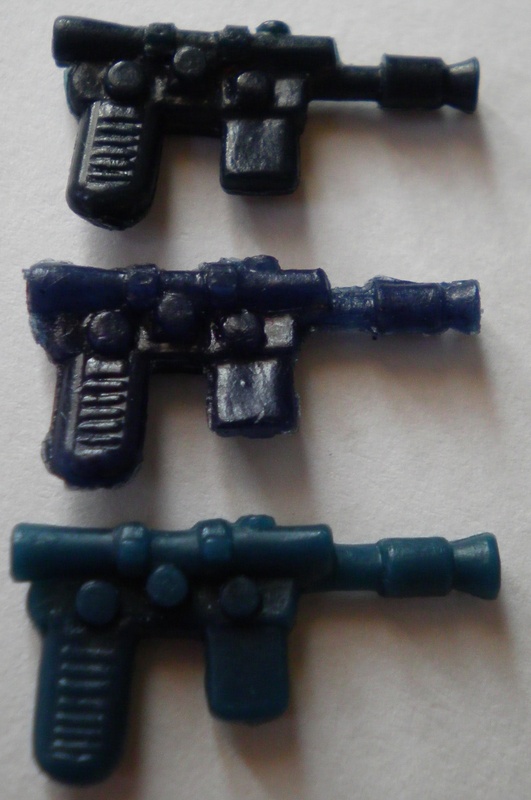 I have had pretty many original and repro smuggler blasters since 2005, a few hundred probably. It looks a bit rough but looks legit to me. Sun fading probably makes it more transparent then it originally was. Subject: Re: Help with this Smuggler Blaster?